Text messages are immediate and personal, yet less intrusive than a phone call because they don't require immediate action and are fast and easy to view. That's why texting has become the planet's single most popular way to communicate--surpassing even telephone calls! Great for event invitations, news alerts, or any message that needs to be quickly and personally delivered. Using other Voicent Live tools, Automated SMS can be easily integrated into any automated workflow or business process. It's perfect for communicating shipping statuses, sales confirmations, account validation, or other event-related messages. Voicent Live's automated SMS test messing tool includes an intuitive, easy-to-use interface, built-in Message Designer for creating personalized text messages. Automatically insert your contact's names, phone numbers, or other specific information into your messages to give your campaign a persuasive, personal touch. 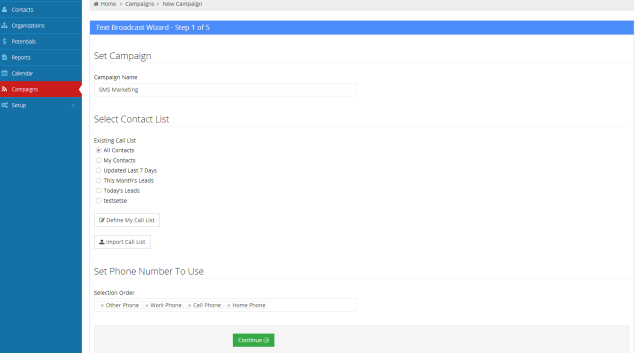 The built-in scheduler makes it easy to plan out your campaigns in advance. Set the specific days and hours your messages will be sent. You can even set up daily, weekly or monthly recurring SMS text message campaigns. See when and how your contacts were added to your contact list. Watch for opt-in spikes to see when your marketing efforts are clicking. Track opt-out spikes to learn from campaigns that didn't connect.